In honour of our holiday to Sweden (Jonas first trip home since 2003! 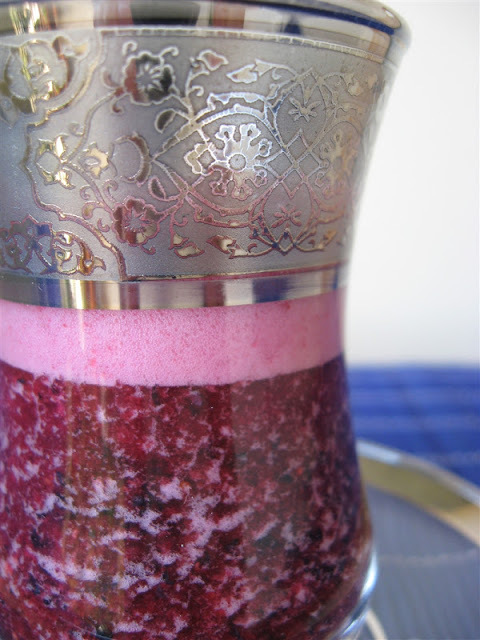 ), I have decided to post seven blueberry recipes in seven days. When Jonas was a wee-one, he was allergic to blueberries. How terrible to live in a country where delicious blueberries grow wild along the roadside, only to discover your allergies had subsided once you migrate to Australia, a country where one tiny punnet can easily cost $7!!! Blueberries are now one of Jonas’ favourite berries and whenever I think of them I always remember our camping trip through southern Sweden with his mother, Ulla. Somewhere in a Småland forest, in the Glasriket, Jonas and Ulla smiled patiently at me while I jumped from bush to bush shouting with glee and collecting handfuls of these precious, wild berries. Once we set up our tent that evening, Ulla fried up some tomatoes and Karljohanssvamp (porcini /cep) and then we ate fresh wild blueberries and raspberries. I was so excited I didn’t even mind the occasional worm. My second blueberry association is related to my sister Shamu (obviously not her real name, yes I'm a cruel sister). Blueberries have always been one of her favourite berries too and at Christmas she took her partner, Tombolina, to spend some time on her mother’s property in Robertson. The neighbours had a huge blueberry farm that they weren’t harvesting so Shamu went nuts picking buckets of blueberries, twigs, leaves and unfortunately a few lizards. She brought me back a 3kg bag which, given how expensive these little buggers are in Sydney, was AMAZING! After freezing this bag, I managed to make an extensive array of blueberry dishes, and in the lead up to our Swedish holiday, I am going to post blueberry recipes for the next seven days. First up is Studená Borůvková Polévka, a chilled blueberry soup from the Czech Republic. 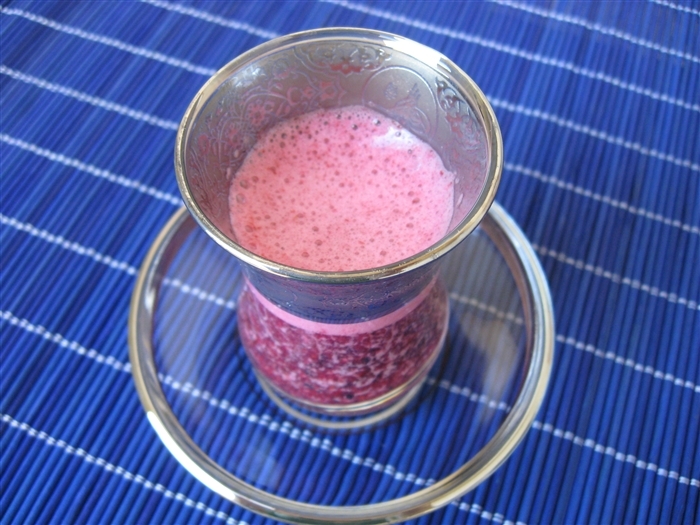 Fruit soups are common summer starters in Central Europe. 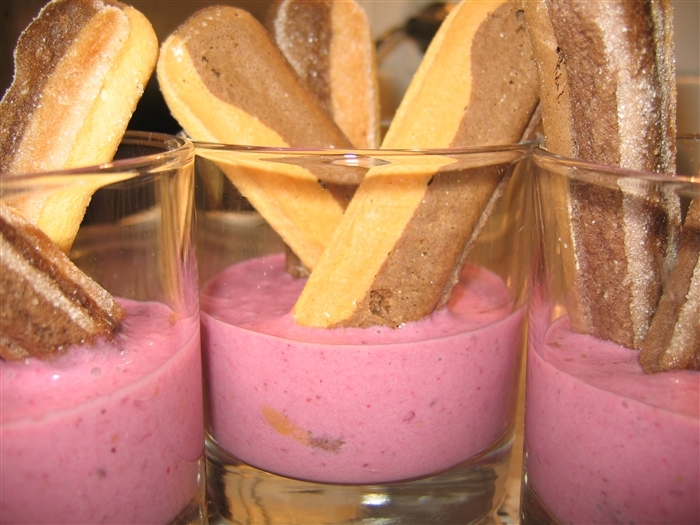 The Hungarians have the famous sour cherry based meggyleves, but Poland, the Czech Republic and Slovakia all have various chilled fruit soup dishes too, usually served before pork main courses. Although these soups can be sweet due to the natural sugars of the fruit and the addition of wine, the dishes are served as savoury courses. My soup recipe was used for a pre-dessert course during one of my multi-course dinners: taken between the main of veal and a dessert of rich, sticky fig and chocolate cake. The tart, fresh flavours of the berries made an excellent contrast between the richer courses and even though the soup was very strong in flavour, it still acted as a palate cleanser. Anna’s adaptation of various internet recipes. Serves 8 x 125ml or 4 x 250ml. 1. Simmer the wine for 2 minutes to evaporate some of the alcohol. 2. While the wine is still hot, stir in honey to dissolve. Allow mixture to cool. 3. Combine all ingredients (except yoghurt) in a food processor and purée well. 5. Serve with a swirl of yoghurt. By creating this recipe, I managed to tick off another 2008 Food Resolution to create my own recipe for a fruit soup, although I do have plans to make another one once the weather warms up a little. Well, that’s the first of the seven blueberry recipes for the week and I’d like to enter it into July’s berry themed Key Ingredient Cook’s Kitchen (KICK) recipe contest hosted by Sophie from The Back Burner. It’s cold here in Sydney. The days are deceptive with their blue skies and sunshine but the wind is icy and the nights are chill. What better way to warm up than with a belly full of meat and potato. So comforting. 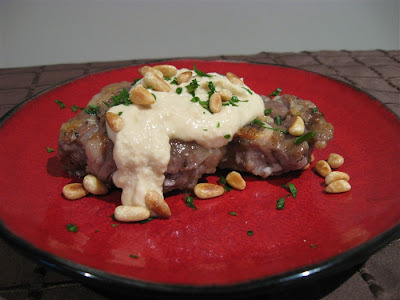 This is (apparently) an Argentinean recipe, part of my 2008 food challenges, but I’ll let the Argentineans decide whether it's truly tradtional or not. I’ll enjoy eating it nonetheless. 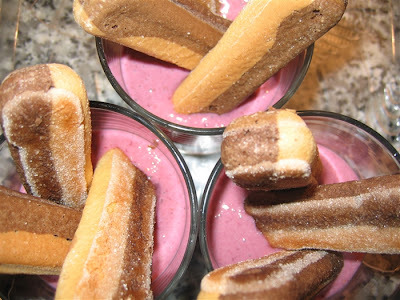 Recipe from Popular Traditional Argentina Food. Serves 2. 1. Heat the oil. Fry onions and garlic. 2. Stir in tomatoes and tomato sauce when onions turn light brown. 3. When tomatoes are cooked, stir in ground beef. 5. Cook until beef is brown. Remove from heat and season. 6. Oil a baking dish and then spread half the potatoes on the bottom. 7. Spread the ground beef over the potatoes. 8. 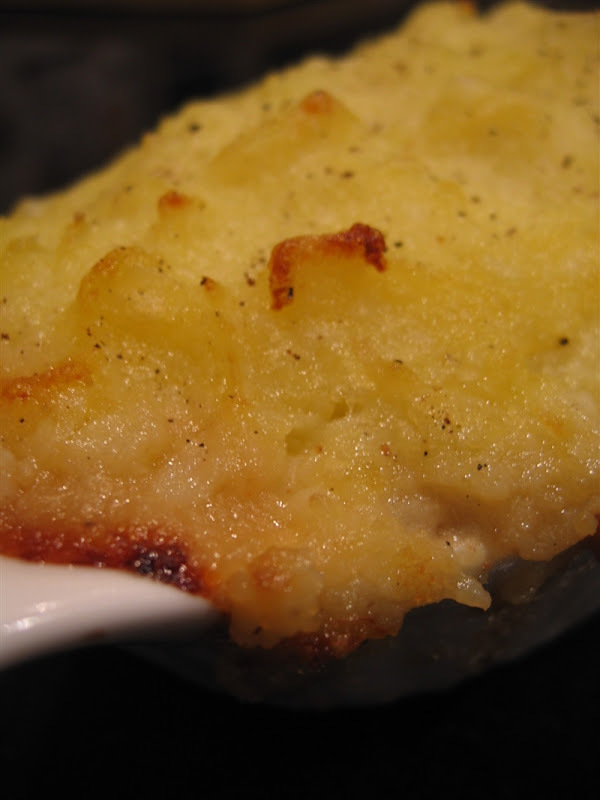 Cover the ground beef with the remaining mashed potatoes. 9. Bake in oven till the top is lightly browned. Tonight I had three girlfriends over for dinner: Yvette, Natasha and Holly (yes, you're totally in the blog Dorbs). Poor Jonas was turfed out of the house after I press-ganged him into a day of mass cleaning and cooking. It's 3am and he's still out with his friends. I guess that's what I get for kicking him out and telling him to entertain himself. Well I enjoyed a lovely evening of chit-chat and catch-up and, as always, I planned an elaborate multi-course meal. I went with a Mediterranean theme, sticking to Lebanese, Italian and Greek flavours. Although we had a quick sojourn north into Czech cuisine for a mid-course. When we cut the cake, I thought of Helena, my sister-in-law, who is celebrating her birthday today in Sweden. Based on the above menu, there are so many possibilities I could focus on for Weekend Herb Blogging, but I have decided to go with an appetiser: the Sumac Scallop w Pomegranate Molasses & Herbs. I’ll post the other recipes later, for those interested. Anna’s very own recipe. Serves 4 as an amuse bouche. 1. Rub sumac all over the scallops. 2. Heat oil in a pan until very hot. 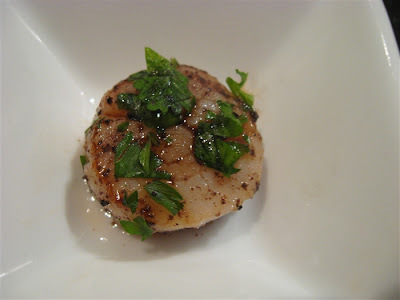 Sear scallops for 1 minute on the first side then flip and fry 30 seconds on the other side. 3. Combine the coriander and parsley. 4. 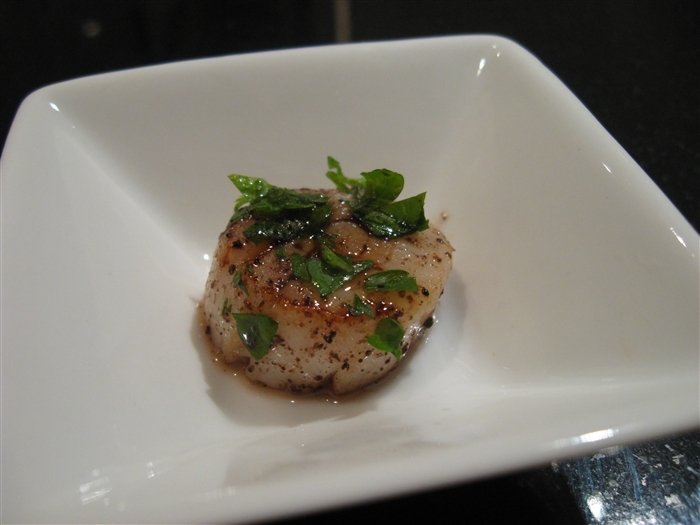 Place scallops into small serving dishes and spread herbs on top. 5. 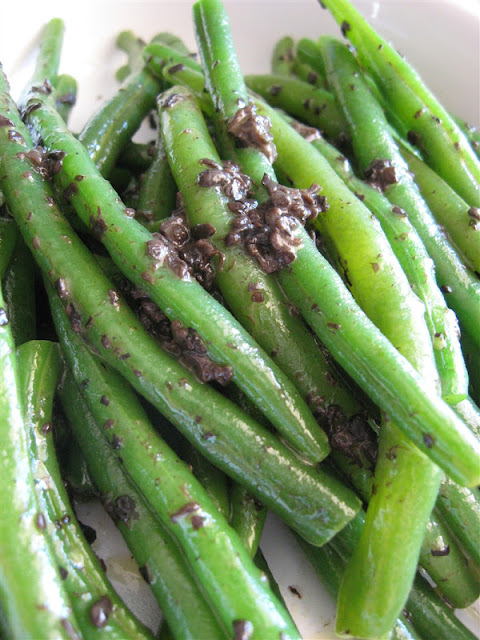 Place one drop each of the lemon juice and pomegranate molasses on the top and serve. I’ve covered coriander, sumac and pomegranates all before so there’s only parsley left. I can’t believe I haven’t written a proper post on parsley yet, it’s my most used herb! Around the end of high school I didn’t like parsley very much. I remember when my friend, Emily, broke a sprig from a bush and started eating it, I reacted with gagging. We both remember that moment to this very day. Weird memory. Nonetheless, now I always have it in the fridge and use it in many (if not most) of my dishes. But only flat leaf (or continental parsley). I don’t like the texture of the curly one, it reminds me of the garnish from a butcher's display. Apparently parsley originated in Iran and its English name is a homage to its heritage Pars/Persia. The two types of parsley are the milder curly version (Petroselinum crispum) and my favourite, the flat-leaf type (Petroselinum neapolitanum). Apparently chemical analysis shows the flat leaf version is stronger in flavour because it contains higher levels of essential oils. In China parsley tea was used to alleviate high blood pressure and Native Americans believed it strengthened the bladder. Parsley supplements are dangerous to pregnant women by stimulating uterine contractions and early labour, but on the plus side crushed parlsey rubbed onto mosquito bites can reduce itchiness. Parsley plants are like the bodyguards of the garden, attracting wasps and other predatory insects who feed on the pests. Sumac - tart, sour powder created from grinding the dried berries of the Rhus coriaria. 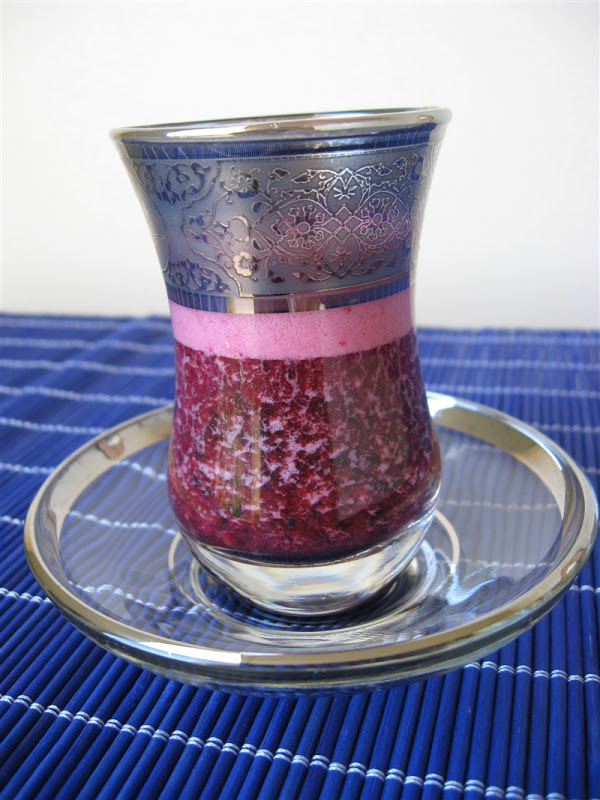 Pomegranate Molasses – thick, tart syrup made from reducing pomegranate juice. There's a whole lot of tart in this recipe. Our hostess is the WHB founder – Herb Goddess Kalyn of Kalyn’s Kitchen – so be sure to visit her round-up and check out all the great (and healthy) recipes on her blog. I have been participating in a lot of vegetarian events lately (a salute to my veggie-loving husband) but now I am turning to the dark side. Although I’m probably less fastidious about sourcing straight-from-the-farmer produce (not having a driver’s license can narrow your options) I certainly try to investigate new techniques, trial interesting recipes and source unique ingredients. With this in mind I decided to join Hank’s monthly meat event, Meat & Greet. 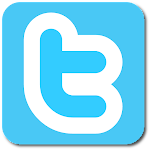 This month the theme is “things that used to fly”. But it’s not as simple as that. Hanks has thrown us all a worthy challenge to ensure either the ingredients (ie the flyer) is unique or the recipe is unusual. Since I’ve already covered emu (which technically doesn’t fly anyway), I resorted to chicken rather than a weird exotic flying thing. I can hear Hank crying out in frustration but when you have a vegetarian husband I can assure you it's hard justifying a mega cook-off for one. I went with boring ingredients but an interesting recipe. I decided to trial some Senegalese food! 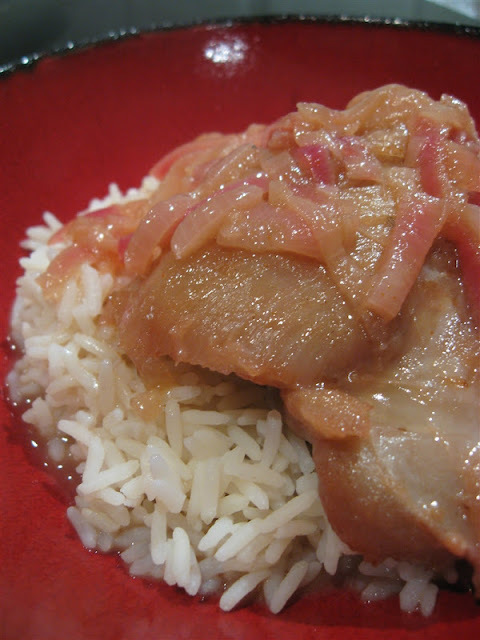 Yassa au Poulet is a recipe that is appearing more and more across the net, and I went with the version appearing on a fellow food blogger, Marga’s website, since she lists it as one of her favourite recipes. She’s not wrong! It was delicious. 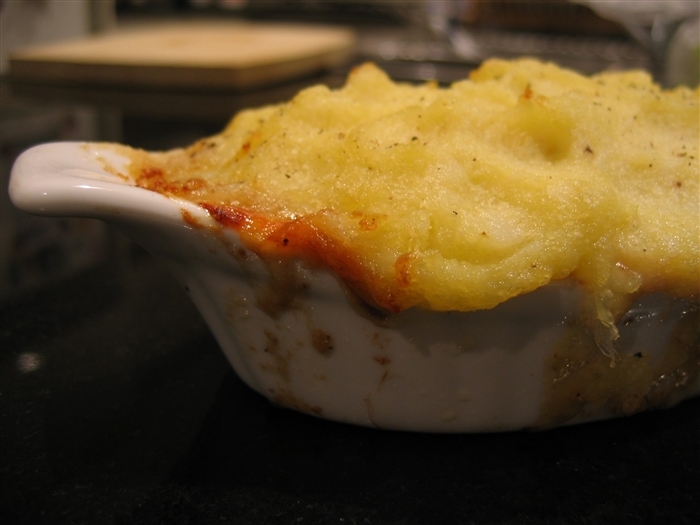 I’m big on sour flavours and this dish really delivers. Soaking chicken in vinegar and lemon juice overnight certainly creates a pucker. Recipe by Marga. Serves 4. 1. Mix the lemon juice, the vinegar, half the oil, the onions and pour over the chicken. Marinate overnight, or longer. 2. 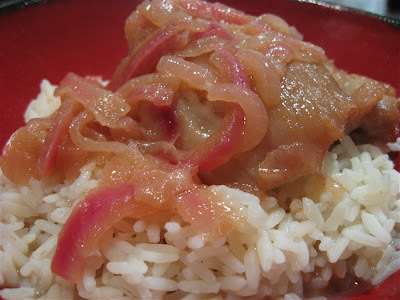 Remove the chicken and the onions from the marinade. 3. In a saucepan, heat the remaining oil and brown the chicken on both sides. 4. In the same pan, fry the onions for a few minutes until soft. 5. Add the marinade, thyme, cayenne, water and bay leaves. Simmer on medium heat for about 10 minutes. 6. Return the chicken to the sauce and cook until done, about 30 minutes. Another reason for choosing a Senegalese recipe is because, as part of my 2008 Food Challenges, I committed to learning more about the food of Western Africa (ie Benin, Burkina Faso, Cape Verde, Cote d'Ivoire, Gambia, Ghana, Guinea, Guinea-Bissau, Liberia, Mali, Mauritania, Niger, Nigeria, Saint Helena, Senegal, Sierra Leone & Togo). 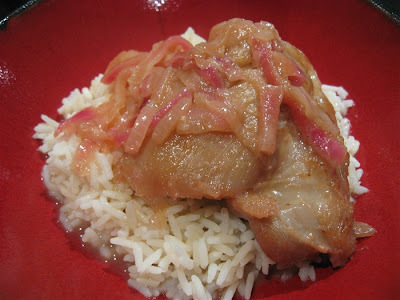 I also committed to learning about cuisine from East Africa, the Andes, the Caribbean and India and I have managed to cover some of these, but Yassa au Poulet is the first recipe I’ve tried from West Africa. Senegal is bordered by Mauritania (north), Mali (east), Guinea and Guinea-Bissau (south) and the Atlantic Ocean (west). It is believed that Senegal has been inhabited since prehistoric times. Since 11th century the territory has been part of various African and Islamic empires and in the 15th century the Europeans began fighting over it too. In 1677, France took the reigns and used the island of Gorée as a major slave trading port until France abolished slavery (for the second time!) in 1815. Under the African, Islamic and European empires (between 1300 and 1900), it is estimated that close to one-third of the population was enslaved! Senegal is comprised of various ethnic groups and the Wolof people are the largest population at 43%. Other large groups include the Peul, Toucouleur (also known as Halpulaar, Fulbe or Fula), Serer and Lebou. There are even minority Vietnamese communities! French is the official language of the country, uniting the different ethnic groups under a common, albeit colonial, language. In the capital Dakar, however, Wolof is the most commonly spoken language on the street. 95% of the population are Moslem, 4% Christian (various Catholic and Protestant denominations) and around 1%, particularly in the south-east, maintain animistic beliefs. Kangkung Belacan is a quintessential Malaysian dish: healthy, spicy and full of flavour! To most Westerners the smell of the paste (even when cooking) is pretty horrid, but it delivers such a rich, salty flavour to the food that it’s worth a little unpleasantness during the cooking process. 1. 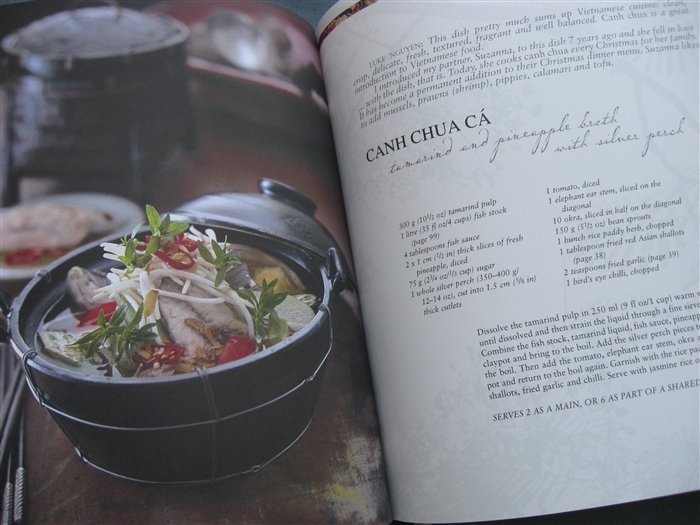 With a mortar and pestle, form a paste using the belacan, dried shrimp, garlic and chillies. 2. In a large wok, heat only a little oil and fry paste with shallots until fragrant. 4. Add kangkung and stir fry until wilted. Add a few drops of water if needed to moisten the sauces, which should coat the greens but not contain too much liquid. 5. Serve with rice as a side dish. Now I might have described the belacan, but this is Weekend Herb Blogging so it’s time to talk about the vegetable: water spinach. 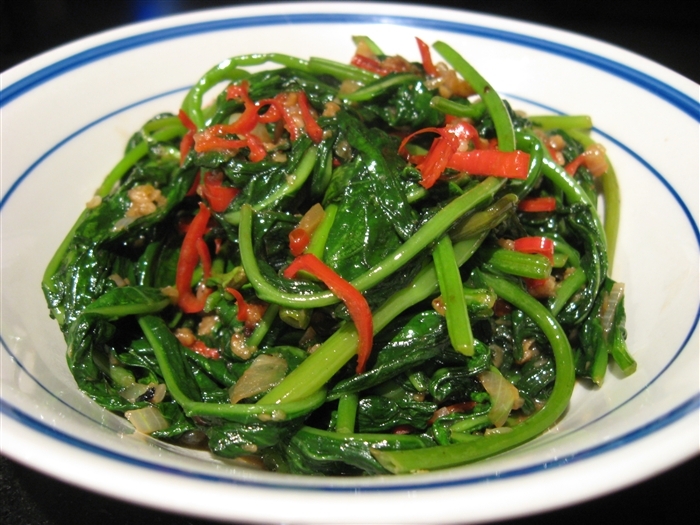 Water spinach is commonly known in Australia as ong choy because it’s a popular vegetable amongst the Chinese who seem to be the main grocery sellers. 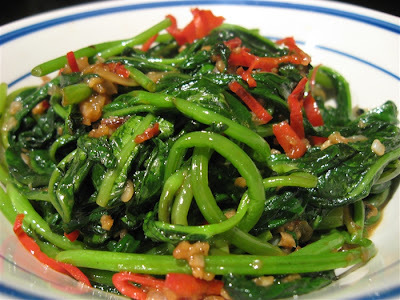 I first encountered it in Indonesia and so the name kangkung is what stuck in my head, and it’s the same word in Malaysian since the two languages are so similar. Closely related to sweet potato, Ipomoea aquatica grows in tropical regions and is a semi-aquatic, climbing plant with long hollow stems allowing it to float. It’s been cultivated so extensively that its origins are unknown, although these days it’s mostly grown in East and South East Asia. Although in the USA (Florida & Texas) it thrives so well it’s been officially declared a noxious weed. Maybe some people should get out to the swamps and start eating!!! The Chinese (always a very symbolic people) were concerned that over-consumption of water spinach would lead the eater to become weak and hollow, like the stem and therefore discouraged eating too much. Water spinach is very easy to grow and be cultivated by breaking off a stem and planting it in moist earth. In greenhouses it can grow about 10cm (4in) a day and reports have seen yields of 10kg per square metre (22lbs per 1.2 square yards)!!! 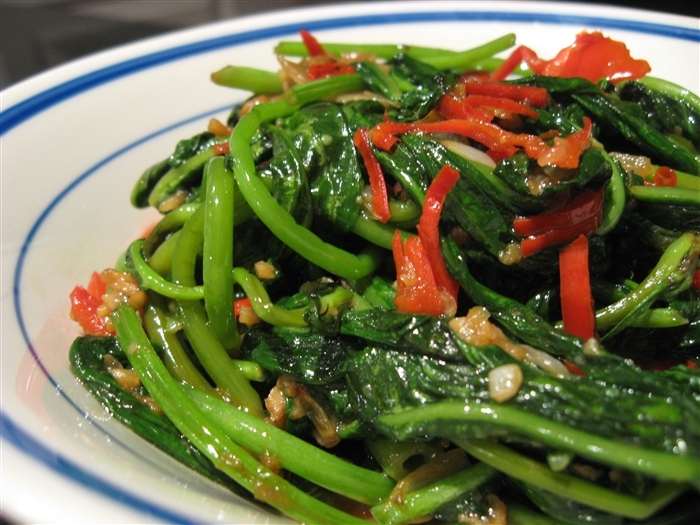 Water spinach is known by so many names, some of which you may have heard before. In English we call it swamp cabbage, water convolvulus and water morning-glory. In other languages it appears under the banners kangkung (Indonesian, Malay), kangkong (Tagalog), eng chai (Hokkian), tangkong (Cebuano), kang kung (Sinhalese), trawkoon (Khmer), pak boong (Thai), rau muống (Vietnamese), sum choy (Hakka), kongxincai, ong choy or tung choi (Chinese). Water spinach has a lovely mild flavour, without the bitterness of it’s land cousin, and contains high levels of iron and calcium. But just don’t eat too much or you’ll discover it has a mild laxative effect!!! This is my contribution to Weekend Herb Blogging. 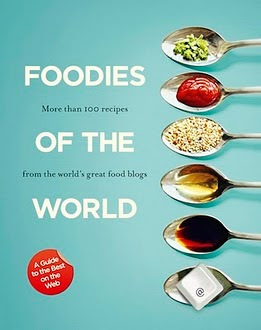 Head over to Joanna's Food in a few days for Joanna's round-up. Legumes are a vegetarian’s delight. They are any plant (or fruit of a plant) from the family Fabaceae (Leguminosae) and include alfalfa, clover, peas, beans, lentils, lupins and even peanuts. Since the No Crouton Required team have requested a soup or salad featuring legumes for there monthly recipe collection, I thought it might be interesting to use some pigeon peas in an unexpected way. In India, dried, split pigeon peas become known as toor dal, lentils which are often cooked into a side dish or ground to make a flour. Apart from the usual contributions to stews and soups, dals can act as a thickening agent. For instance, if you dry fry then grind the dal and add it to soups it will help to thicken the broth the same way flour is used in European cooking. 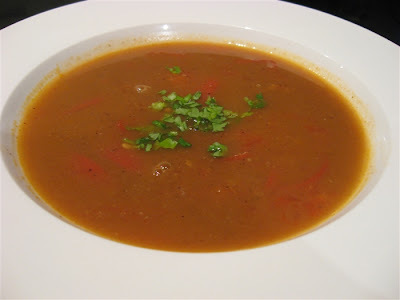 Rasam, a Southern Indian soup, is an excellent example of this cooking technique in practice. 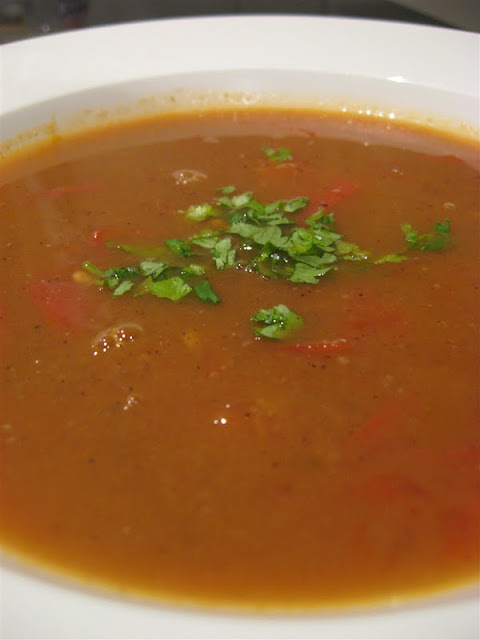 Traditionally rasam is a sour and spicy water (broth) flavoured predominantly by tamarind and pepper or chillies. 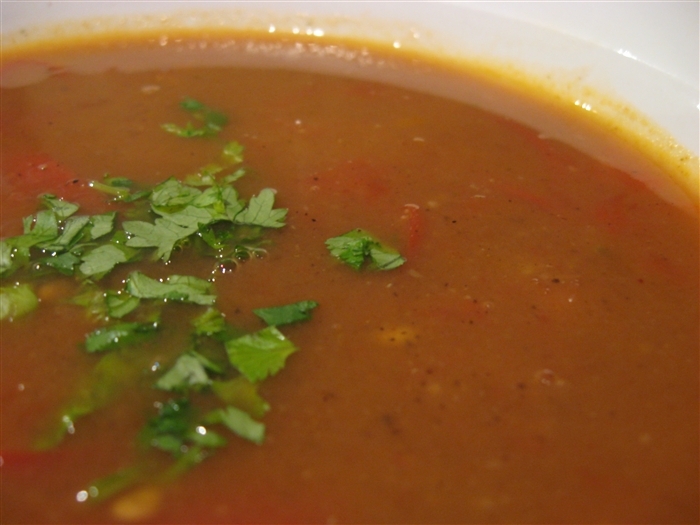 In most cases it’s served in a clear, liquid format but occasionally cooks add a little dal flour to thicken the broth into something a little more substantial. 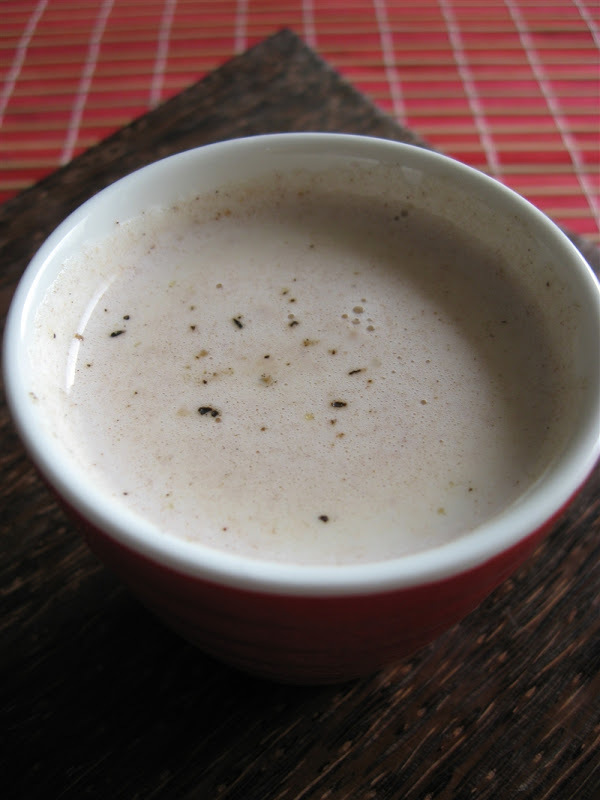 This Tamil Nadu version, based on black peppercorns and tart tamarind is a good example of a thicker rasam. Although I compiled the recipe myself, I drew it from numerous sources across the blogosphere to ensure my own personal version was still true to traditional rasam principles. Anna’s adaptation of various blogger’s recipes. Serves 2-4. 1. Dry fry the toor dal for a minute then add cumin seeds, peppercorns, coriander seeds and chilli. 2. Fry a little longer or until fragrant. Remove from heat and grind to a powder in spice grinder. 3. Mix tamarind purée with 2½ cups of hot water. 4. Heat oil/ghee in a saucepan and fry mustard seeds until they start to pop. 5. Add garlic, asafoetida and curry leaves and fry for 30 seconds. 6. Add spice and dal powder and fry for another 10 seconds. 7. Add tamarind water, half the tomato and salt. Boil for 10 minutes. 8. Strain broth into a clean bowl, press pulp to extract liquid then discard. 9. Rinse saucepan and return broth to saucepan. Add remaining tomato and boil for another 5 minutes. 10. Serve with rice or pappadums or both. Note: I know this suggestion is going to bring shrieks of horror from Indian readers, but if the rasam is too spicy, you could always add a few spoonfuls of yoghurt. It won’t be the traditional broth anymore, but you’ll still taste the key flavours of tamarind and pepper and it’s very delicious. The pigeon pea (Cajanus cajan, syn. Cajanus indicus) has been cultivated for 3000 years and most likely came from Asia to Africa and then through the slave trade to the Americas and Caribbean. It is widely cultivated in more than 25 tropical and semi-tropical countries of the world, with India producing around 82%. It’s not hard to see why toor dal is India’s most popular dal, especially when you know it is very drought resistant and has huge levels of protein and amino acids (methionine, lysine, and tryptophan). In India, toor dal is known by many names: tuvar dal (Gujarati), arhar dal (Uttar Pradesh, Orissa & Bengal), togari bele (Kannada), kandi pappu (Telugu), tuvara parippu (Malayalam), tuvaram paruppu (Tamil). Cooking the rasam from Tamil Nadu (Wikipedia map below), accomplished another of my 2008 Food Resolutions and provided me something to contribute to the June challenge for No Crouton Required: a monthly vegetarian soup and salad blogging event. 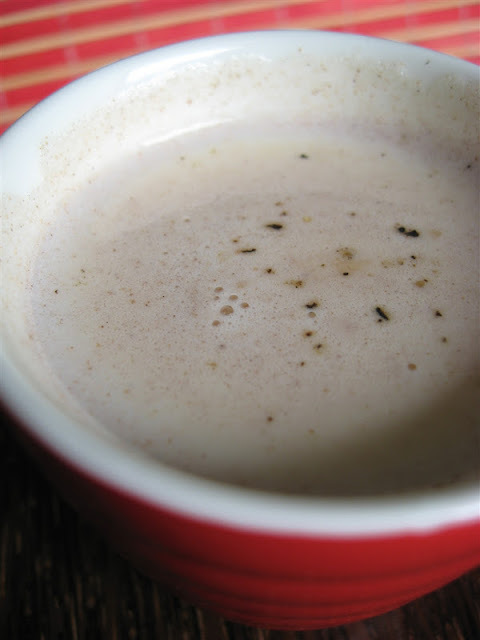 Sorbat Susu is a warm, sweet, spiced milk from Indonesia. At least I think it is. 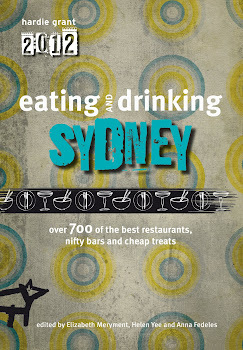 I have only drunk it here in Sydney (Badde Manors Café in Glebe to be precise) and Googling the recipe has proved fruitless. I know susu means milk in Indonesian, but what is sorbat? Can anyone shed some light on this? My recipe is a take on what I drank at Badde Manors: sweet and warm gingery milk spiced with black pepper. The original recipe serves the ginger in the milk but this creates difficulty for the drinker, so I decided to infuse my milk and strain it before serving. It’s a much more pleasant experience this way. Anna’s version of the Badde Manors drink. Serves 1. 1. Heat all ingredients over low heat. While heating, use an egg beater to whip milk into a slightly frothy consistency. Taste as it may need sugar. 2. 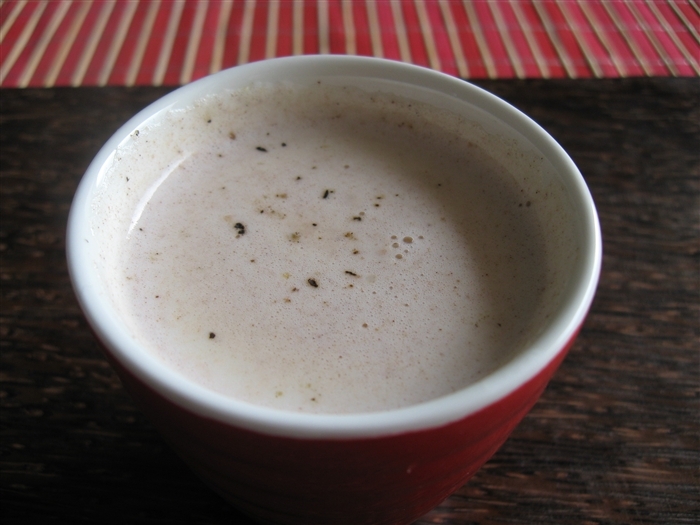 Strain into a cup and top with a little freshly ground black pepper. Serve hot. This is a perfect winter warmer, which suits me wonderfully these days as the rain and wind howls outside and curl up on the sofa under a blanket and get my Battlestar Galactica fix (I am completely addicted). Some recent birthday presents are also proving inspirational. 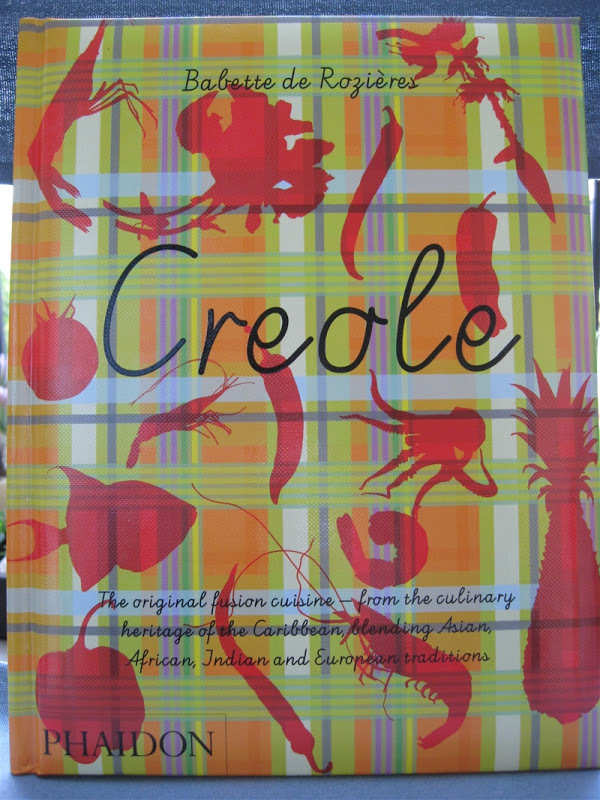 First was Tia Bicky’s purchase of Creole, a Caribbean cookbook by Babette de Rozières. I don’t know much about Caribbean food, but the book contains some really interesting recipes such as lamb in turmeric and wasabi, cocoa mustard rabbit or conch ravioli. It also touches on Caribbean classics such as salt cod acras, swordfish ceviche and Creole-style pigeon peas. Papaya jam, coconut flans and mirliton tarte tatins (choko/chayote) are among the exciting desserts. And then last night Shamu delivered her gift to me, The Secrets of Red Lantern by the Nguyen family who run an exquisite Vietnamese restaurant in Sydney, where I have enjoyed many a meal. The book covers some of my favourite dishes from the restaurant, such as Bò Tái Chanh (lemon-cured sirloin) and Muc Rang Muôi (salt & pepper squid) but also includes classics like Goi Ðu Ðu (green papaya salad) and Thit Kho Trúng (caramelised pork). I am also fascinated by the exotic Dua Cai Chua (pickled mustard greens), Ôc Luôc (steamed periwinkles), Che Trôi Nuóc (sweet mung bean dumplings in ginger syrup) and Kem Trái Bó (avocado ice cream). 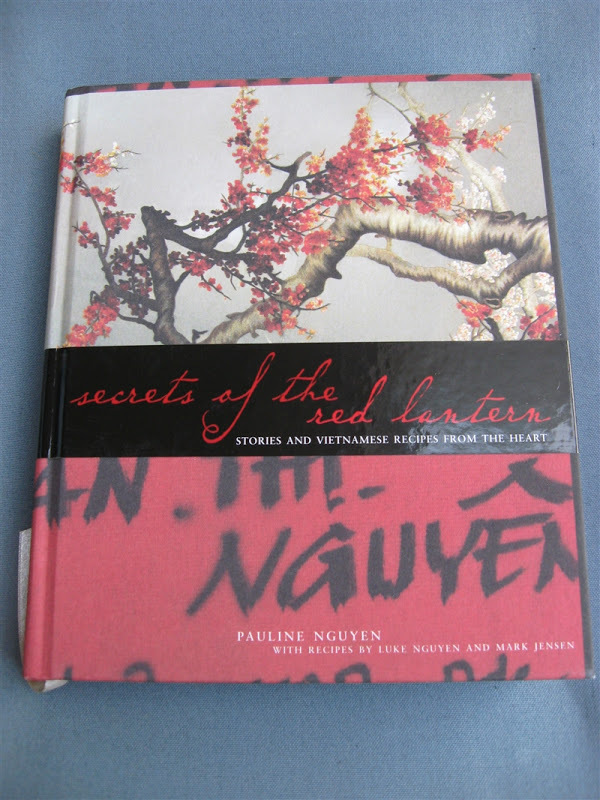 But what’s even more wonderful about this book is the family stories sprinkled throughout, containing everything from migration to Australia, to moving family estrangement and coming full circle in a bittersweet reunion. I’ve already shed a few tears. Drinking the sorbet susu and leafing through these great new cookbooks has been a wonderful experience, and checks off three of my 2008 Food Resolutions! OK, so there’s a big photo of lamb on post for a vegetarian event, but hear me out. My two feature recipes for the Middle Eastern theme are the Lebanese classics hummus and tabbouleh: both vegetarian! I just wanted to show how these dishes can also accompany meat dishes, for those who cannot live without meat. You can do so much with hummus. Eat it as a dip, mix it through other ingredients to make a sauce, even use it as the base of a pizza (it sounds weird, but trust me it can be very tasty). Lebanese hummus is my favourite kind of hummus. I must admit I haven’t tasted Syrian or Jordanian, but I certainly like Lebanese hummus better than the Israeli or Palestinian versions. Why? 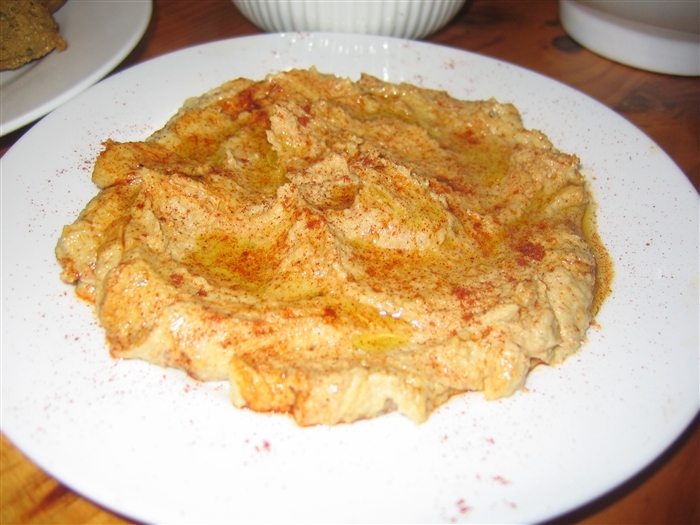 Because the Lebanese use the perfect balance between the chickpeas and the tahini whereas Israeli and Palestinian hummus uses more tahini. I hope I haven’t started a war here! When we make hummus at home, we’re very lazy. We really should use dried chickpeas instead of canned, but who can be bothered soaking and cooking and spending hours fussing over some legumes when you can open a can and have creamy hummus in seconds? Jonas' very own recipe. Makes about 1½ cups. 1. Put in food processor with juice, tahini and garlic. Blend. 2. Add oil while processor is on, in small batches to ensure it does not get an oily consistency. 3. Season to taste. Optionally, add a sprinkling of cayenne pepper and/or sesame seeds. 4. Before serving, garnish with a sprinkling of paprika or sumac and a little olive oil. This quick and easy salad is an excellent side dish to any Middle Eastern meal, incorporating parsley and mint, as well as olive oil and lemon juice, all vitally important ingredients in the cooking of the Levant. 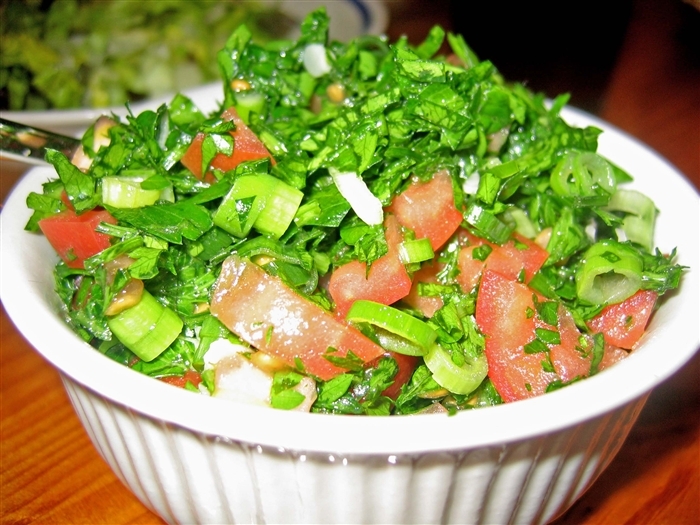 Traditionally tabbouleh contains burghul wheat (also known as cracked wheat) to make it more substantial, but I prefer to omit this grain and serve a purely leafy salad version (pictured blow). Recipe from Meze by Family Circle. Serves 4. 1. Cover the burghul with ¾ cup (185ml) boiling water. Leave for 30 minutes or until the water is absorbed and the grains have swollen. 2. Combine the tomato, onion, parsley, mint and burghul in a bowl and season well. 3. Whisk together lemon juice, olive oil and garlic then toss through salad before serving. So how would I serve my hummus and tabbouleh? Alongside lamb, the most common meat used in the Middle East. I suppose the small size of sheep and their hardiness in dry, rocky terrain makes them the perfect farm animal of the Levant! 1. Fry lamb chops in olive oil until cooked. 2. Meanwhile, combine lemon juice, hummus and salt to taste. 3. 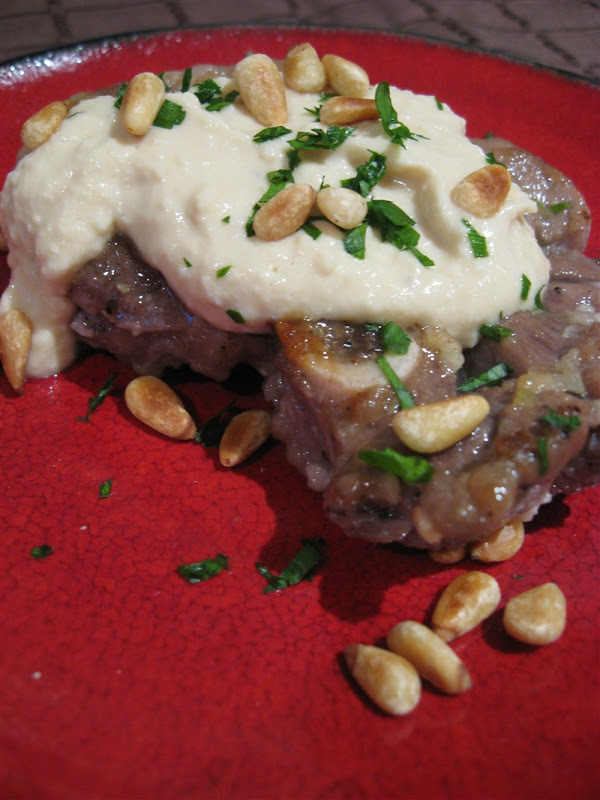 Plate lamb then spoon over hummus. Sprinkle with pinenuts and parsley then serve. All these recipes are my contributions to the vegetarian event AWED or A Worldly Epicurean's Delight. Every month we focus on a new country, and this time the theme is the Middle East. Obviously this covers so many countries, but I decided to narrow it down and focus on Lebanon. Our host this month is Siri from Siri's Corner so be sure to check out the round-up and the wide variety of foods from so many countries throughout the broad and general area known as the Middle East. Jonas discovered this recipe online one evening and made it for me and my friend. 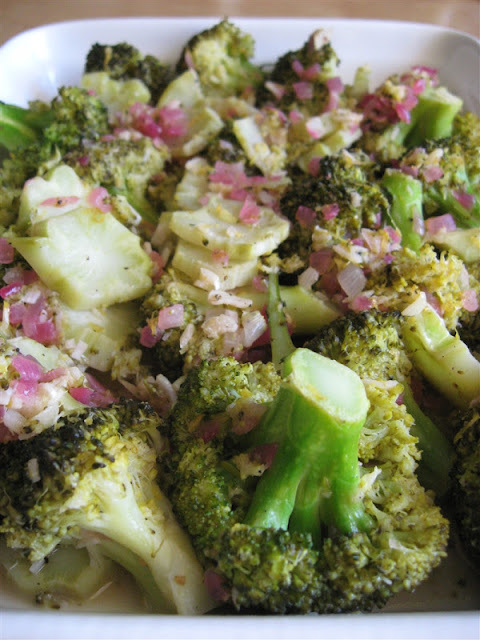 It is so deliciously lemony that even avid broccoli-loathers will be converted. I remembered when George Bush Snr publicly admitted he hated broccoli. I thought all the growers were ridiculous when they rallied in rage against him. So some people don’t like broccoli, get over it! Who is going to stop eating broccoli because the President doesn’t like it? Come on, surely it's an incentive to start eating it by the truckload! I have always liked broccoli. As a child it was one of the few greens I didn’t detest. Broccoli and beans, liberally sprinkled with vinegar. Mmmm. Yum. Now I’ve switched to lemon juice, but it’s the same theory. Turns out Amy meant the flower heads, not the actual leaves. Of course all us kids knew what she’d meant from the outset. What kid doesn’t think broccoli florets look like miniature trees with their green stalk/trunks and flower heads/leaves! 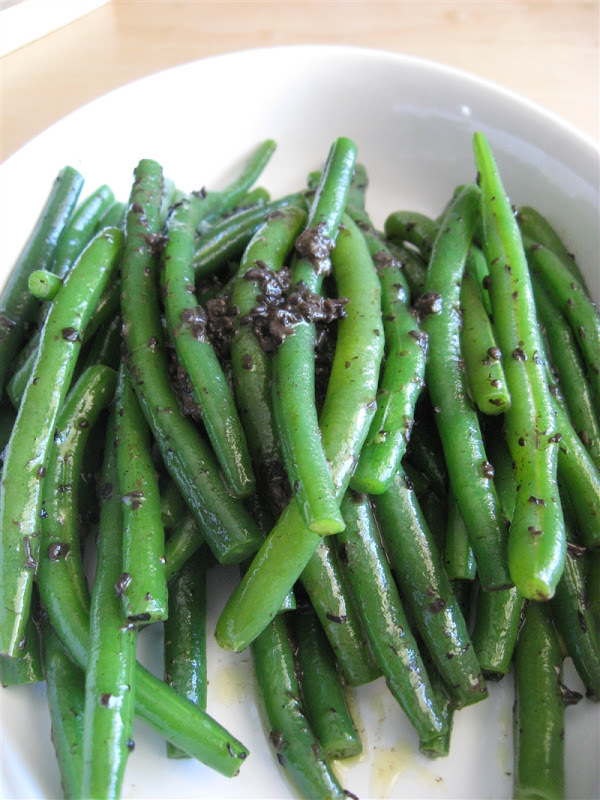 This is one of my favourite side dishes because it’s healthy and really cheap to make. Jonas’recipe. Serve 4-6 as side dish. 1. 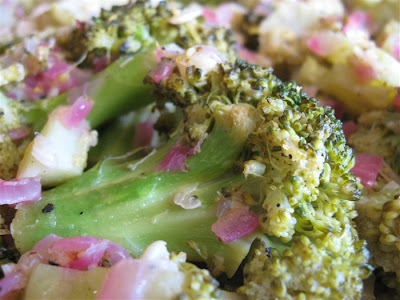 Break broccoli into small florets. Peel stem and slice into rounds. 2. 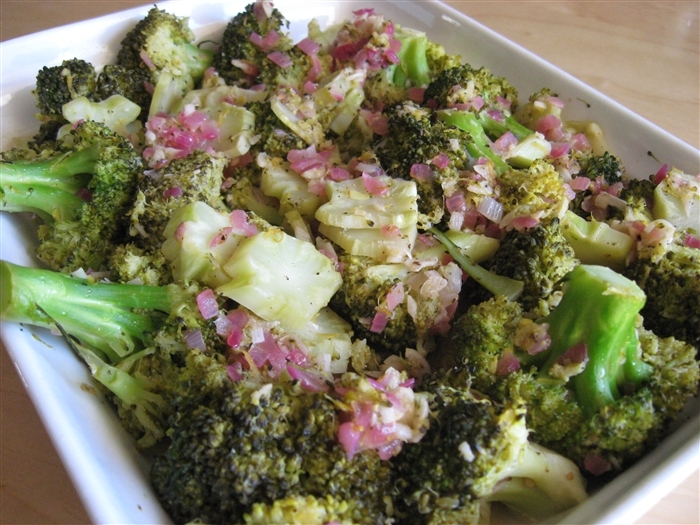 Steam or boil broccoli florets (not stems) until tender but firm, about 5 to 7 minutes. 4. Add garlic and broccoli stem and sauté until stems are soft. 5. Add the broccoli florets, lemon juice and salt and pepper to taste, cooking briefly to combine. Here's my entry to the weekly food blogging event, Weekend Herb Blogging. Our host this week is Astrid from Paulchen's Food Blog. This Nutriferia event is called Berrylicious and aims to collect all the delectable berry recipes out there in the blogosphere. My recipe is straight out of a Australian Gourmet Traveller magazine from years ago and is a twist on the old Italian classic. I had a similar version using Brachetto d’Acqui instead of prosecco (at the 2006 Vinitaly wine fair in Verona) and that was pretty tasty, but since Brachetto d’Acqui is pretty rare in Australia I recommend sticking to the prosecco. Recipe from Gourmet Traveller. Serves 4. 1. Process the berries in a food processor until puréed, then push through a fine sieve over a bowl to remove seeds. Makes about 1 cup of purée. 2. Combine egg yolks and sugar in a heatproof bowl and whisk until well combined. 3. Add berry purée, grappa and prosecco. 4. Place bowl over a saucepan one-quarter filled with simmering water and, using a hand held balloon whisk or electric whisk, whisk to 5-8 minutes or until mixture is thick and frothy and holds a trail. 5. Divide the quartered savoiardi among four 1-cup-capacity glasses. 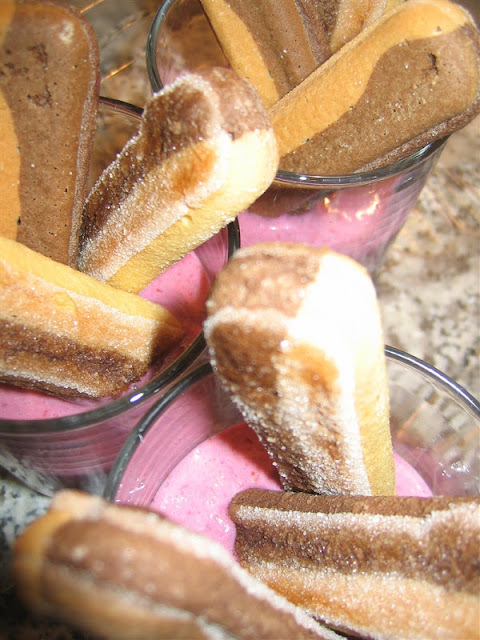 Top with zabaglione and serve immediately with extra biscuits passed separately. Note: if you want to make something similar but you’re far too lazy, you can cheat: purée berries with some icing sugar and heavy cream and serve with savoiardi. This is probably my all time favourite pasta sauce. It’s got all the right strong, pungent ingredients to make a punchy, lively sauce: garlic, capers, chilli and anchovies. All my favourite sour, bitter and salty flavours! The irony with this dish is that Jonas makes it so well, even though he can't eat it because it contains fish. For those who speak Italian, the name of this sauce is slightly perplexing, translating to “whore style”. What makes it whore-like is beyond me, but there are many theories. Whatever the origins, it is not a traditional sauce and only entered the written word in 1961. 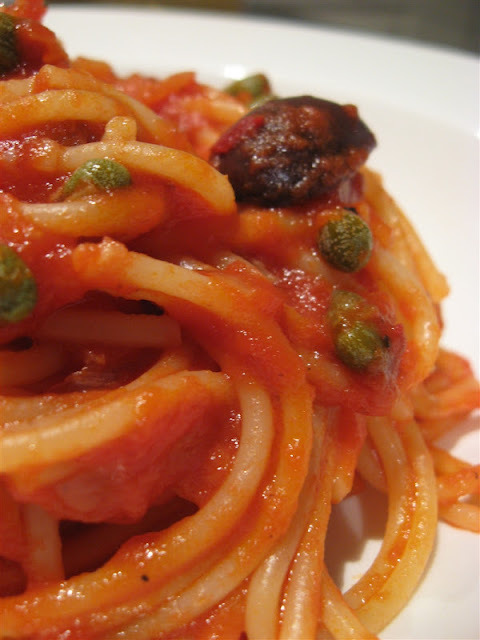 The Unione Industriali Pastai Italiani (Italian Union of Pasta Makers) claim the sauce came into its own in the 1960s. 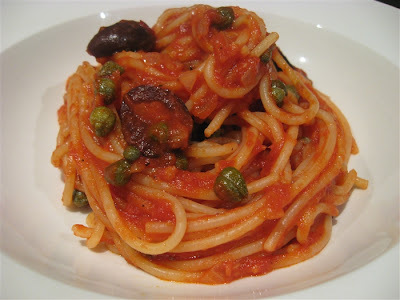 Traditionally puttanesca is served with spaghetti, but truth be known I prefer it with short pasta such as penne or rigatoni that are rigate (grooved) to catch more sauce. I’m sharing this recipe with Ruth from Once Upon A Feast as part of her Presto Pasta Night Friday event. I can’t always get myself organised fast enough on Fridays to contribute to PPN, but when I can, I do! 1. Begin boiling water for pasta. When ready, add pasta. 2. While waiting for water to boil, heat oil in saucepan, fry onion for 1 minute. 3. Add garlic, anchovies and chilli flakes and cook for another minute, mashing anchovies slightly. 4. Add tomato paste, cook for 1 minute. 5. Add passata, oregano, capers, olives and bay leaf then turn down heat to simmer until pasta is ready. Sauce should thicken a little and anchovies will disintegrate. 6. Mix through pasta and put into serving plates. 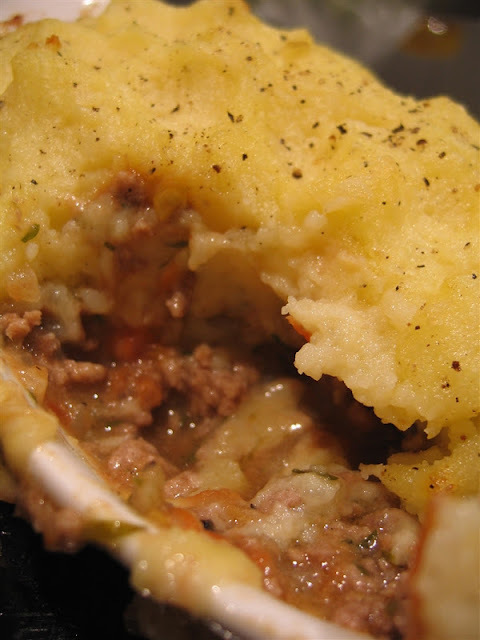 Serve with plenty of grated parmigiano. 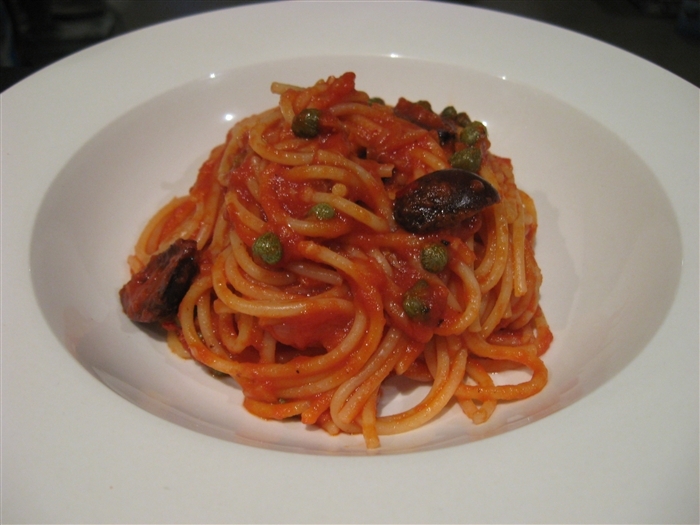 Note: for a vegetarian version, omit anchovies and add 1 extra tablespoon of capers. I'm not sure this recipe could get simpler if I tried. I first served it for last year's Thanksgiving lunch and it's been an easy "wow-factor" regular ever since. Fresh, delicious vegetables speak for themselves. Anna's recipe. Serves appreciative guests. 1. 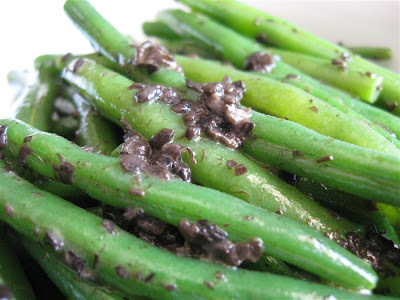 Take some fresh beans and blanch them until soft but still toothsome. Drain. 2. While still very hot, toss through cubes of good quality butter until melted and well coated. 3. Add truffle salsa, salt and pepper to taste then toss to coat beans. Serve hot. If you haven't guessed already, this is my contribution to Weekend Herb Blogging, hosted by Croatian foodie Maninas: Food Matters.